76 x 121 cm (30″ x 48″), oils, £6,000, ex studio, ex frame. 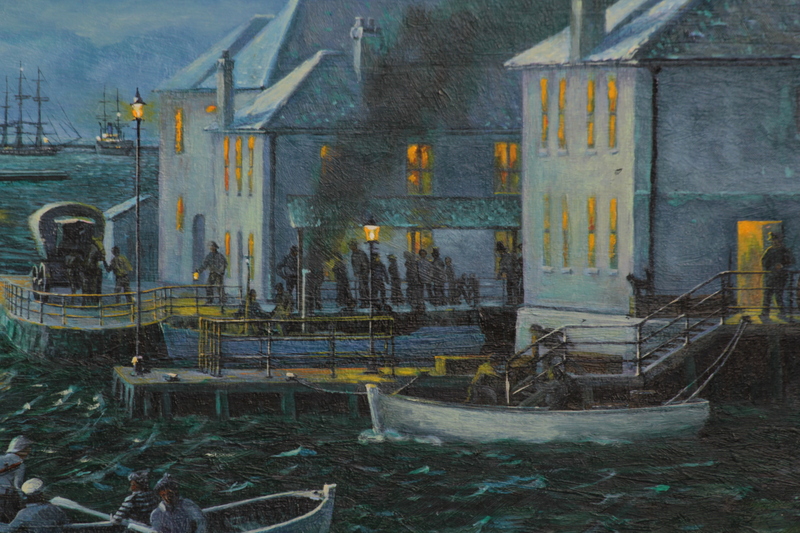 A significant lost history of Plymouth now documented by this painting. Little did I realise just how much history I was standing on and looking at… or how many souls had emigrated via Plymouth. 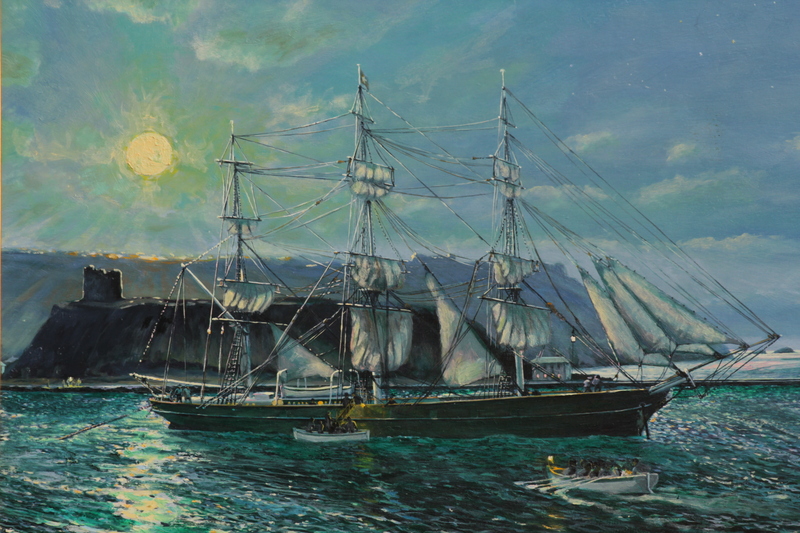 Emigration, Plymouth Cattewater, the painting, little did I realise when I started on this voyage, the painting would become a part of Plymouth’s legacy, being the only accurately detailed representation of this part of Plymouth’s lost history. Samuel Plimsoll” was noted for her record runs annually from Plymouth, mostly to Australia. This painting surprised me in many ways. The location is one I’d long wished to paint. I knew it intimately and was to discover much more. 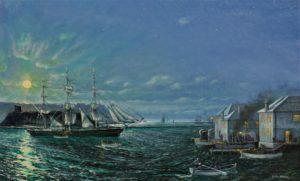 A one off and intimate painting, my original intention was to paint a ‘harvest moon’ as we often saw it rising over Jennycliff, Mount Batten, and Plymouth Cattewater, after an evening sailing and dinner at the RPCYC [Royal Plymouth Corinthian Yacht Club], huge, bright and luminous moonlight over the Cattewater. A view I’d see hundreds of times when returning to my car, of an autumn evening after sailing, racing, with my family. The Samuel Plimsol was a classic full rigged ship built in Scotland. Samuel Plimsol was named for and launched by the great man Mr. Samuel Plimsol MP, known as “the sailor’s friend”. Mr. Plimsol was an ardent campaigner for sailor’s rights, innovator of the ‘Plimsoll Line‘, a mark protecting seamen, which today appears on the ships of 164 countries world wide. For 17 years, annually, “Samuel Plimsoll” was specially prepared to sail from Plymouth with emigrants to Australia and New Zealand. In days long gone, my family and I were members of the Royal Plymouth Corinthian Yacht Club which to this day has two of my paintings, commissioned, in pride of place in their lounge. I chose to show the scene much as it would have looked mid second half of the 19 th century in part because parts of that view are still clearly recognisable but under threat from careless redevelopment. Plymouth, the port, the city, has witness the start of far to many famous voyages to recount here many being voyages that have changed lives and our world, beyond measure. Plymouth was an assembly point for emigrants Plymouth was for centuries, thanks to the kindness of its people a preferred departure point. The Plymouth Emigration Depot, custom built, demolished during the 1930’s was for many years the most advanced of it’s kind. This painting shows you the clipper “ Samuel Plimsoll ” loading emigrants for Australia summer 1884. Via our further reading section you can discover one of the diaries kept by an emigrant who sailed on the Samuel Plimsoll. Today we may justifiably take pride in our city of Plymouth, Devon, England.